elobeatlesforever: A Second Secret Messages 7" Surprise! Hello ... Hello ... my old friends ... It's great to see you once again! The advent of ELO's seminal LP "Secret Messages" [JETLX527] in the summer of 1983 [here in the UK] was marked by lead single "Rock 'n' Roll Is King" [A3500] and another less noticed happening as it saw the familiar 'JET' prefix dropped from the catalogue number in lieu of the then standard CBS Records [UK] 'A' prefix. But that was not the case, at least initially, in Europe with "Rock 'n' Roll Is King" assigned JET7034 and title track "Secret Messages" [UK: A3720] also assigned JET7038. Later singles "Four Little Diamonds" [A3869] and "Stranger" [A4070] were evidently not assigned a formal JET prefix. However, quite by accident, I recently discovered a most unusual 'second' 7" issue of the UK edition of "Secret Messages". It was an almost a duplicate of the original A3720 single but was numbered A7038 [without a JET prefix] with a large hole centre. This 'juke box' issue came in a picture sleeve citing JET7038 and was seemingly intended for the European market via Holland but the record itself was entirely "made in England". 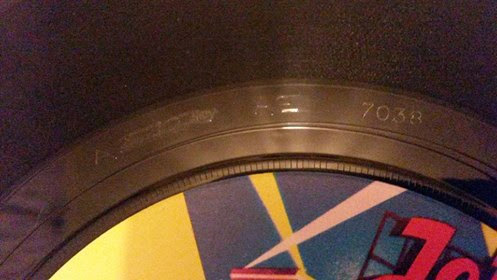 The run-out area [as with the earlier "Four Light Years" boxed set featured here] has '3720' scratched out with '7038' etched alongside [see below], confirming its UK source. Hence, you can [hopefully] see that the thrill is still there for Yours Truly KJS here in 2015 when collecting and searching out ELO and Jet Records vinyl. I really am an ELOnorak aren't I? Also,the label went back to the 1977 "Jet" label,before it was corrected,for the "Out Of the Blue" Lp!